Tomorrowland (also known as Project T in some regions and subtitled A World Beyond in some other regions) is a 2015 American science-fiction mystery adventure film directed and co-written by Brad Bird. Bird co-wrote the film's screenplay with Damon Lindelof, from an original story treatment by Bird, Lindelof and Jeff Jensen. The film stars George Clooney, Hugh Laurie, Britt Robertson, Raffey Cassidy, Tim McGraw, Kathryn Hahn, and Keegan-Michael Key. In the film, a disillusioned genius inventor (Clooney) and a teenage science enthusiast (Robertson) embark to an ambiguous alternate dimension known as "Tomorrowland", where their actions directly affect their own world. Walt Disney Pictures originally announced the film in June 2011 under the working title 1952, and later retitled it to Tomorrowland, after the futuristic themed land found at Disney theme parks. In drafting their story, Bird and Lindelof took inspiration from the progressive cultural movements of the Space Age, as well as Walt Disney's optimistic philosophy of the future, notably his conceptual vision for the planned community known as EPCOT. Principal photography began in August 2013, with scenes shot at multiple locales in five countries. Tomorrowland was released in conventional and IMAX formats on May 22, 2015, and was the first theatrical film to be released in Dolby Vision and Dolby Cinema. Upon its release, the film received mixed reviews from critics; earning praise for its original premise, acting, musical score, action, visuals, and themes, but criticism in regards to the screenplay's uneven writing and tone. The film grossed $209 million worldwide against a total production and marketing cost of $330 million, losing Disney $120–140 million. Frank Walker addresses an unseen audience about the future. Frank, a young inventor, attended the 1964 New York World’s Fair, to sell his prototype jetpack. It is rejected by judge David Nix on the basis that it doesn’t work. Frank is approached by a young girl, Athena, who hands him a lapel pin with a “T” embossed on it, telling him to follow her onto “It's a Small World”. Frank is transported to Tomorrowland, a futuristic cityscape, where advanced robots fix his jetpack, allowing him to fly and join the secretive world. Frank passes the narration to the optimistic teenager Casey Newton. In the present, Casey repeatedly sabotages the planned demolition of a NASA launch site in Florida. Her father, Eddie, is a NASA engineer, but faces redundancy. Casey is eventually caught and arrested. At the police station, she finds a strange pin in her belongings. While touching it, the pin transports her to Tomorrowland. Her adventure is cut short when the battery runs out. With help from her younger brother Nate, Casey finds a Houston memorabilia store related to the pin. The owners, Hugo and Ursula, attack her when she is unable to divulge where she got the pin from. Athena, who gave Casey the pin, bursts in and defeats the owners, actually Audio-Animatronics, who self-destruct and destroy the shop. Casey and Athena steal a car, Athena revealing she is an animatronic, purposed to find and recruit people who fit the ideals of Tomorrowland. Athena drops Casey outside an adult Frank’s house in Pittsfield, New York. The reclusive, cynical Frank declines Casey’s request to take her to Tomorrowland, having been banished from it years ago. Inside Frank’s house, Casey finds a probability counter marking the end of the world, Frank warning her that the future is doomed, but she disagrees, lowering the counter’s probability. Animatronic assassins appear to kill Casey, but she and Frank escape. Frank resents Athena for lying to him about her true nature. He reluctantly agrees to help them get to Tomorrowland. Using a teleportation device, the trio travel to the top of the Eiffel Tower. Frank explains that Gustave Eiffel, Jules Verne, Nikola Tesla, and Thomas Edison co-founded Plus Ultra, a secret society of futurists, creating Tomorrowland in another dimension, free to make scientific breakthroughs without obstruction. The trio use an antique rocket, the Spectacle, hidden beneath the tower, to travel to Tomorrowland. There, they find Tomorrowland in a state of decay. David Nix, now Tomorrowland’s governor, greets them. They travel to a tachyon machine, invented by Frank, which accurately predicted the worldwide catastrophe. Casey refuses to accept the world will end, causing the future to temporarily alter. While Frank attempts to convince Nix to listen, he refuses, arresting the intruders. Casey realises the tachyon machine is telling humanity that the world will end, creating a self-fulfilling prophecy. They confront Nix, who admits he tried to prevent the future by projecting such images to humanity as a warning. Instead, they embraced the apocalypse in fiction, refusing to act to make a better future for their world. Frank, Casey, and Athena attempt to use a bomb to destroy the machine, leading to a fight with Nix. The bomb is accidentally thrown through a portal to an uninhabited island on Earth, the explosion pinning Nix’s leg. Athena sees a vision of the future where Frank is shot by Nix, and she jumps in the way of his attack, mortally wounding her. Making peace with Frank, Athena activates her self-destruct sequence, destroying the machine, but kills Nix too. In the present, Frank and Casey lead Tomorrowland, recruit Eddie and Nate, and create a new group of recruitment animatronics like Athena, who they are addressing at the beginning of the film. Given pins, the animatronic children set out to recruit new dreamers and thinkers for Tomorrowland. Onscreen, Key's character introduces himself as Hugo Gernsback, a tribute to the influence of the man renowned as one of the "Fathers of Science Fiction" and the namesake of the Hugo Awards. In 2010, Damon Lindelof began discussions with Walt Disney Studios about producing a modern science-fiction Disney film, with Tomorrowland as a basis. The project was greenlit by Walt Disney Pictures' president of production, Sean Bailey in June 2011 with Lindelof signed on to write and produce a film with the working title of 1952. Lindelof asked Jeff Jensen — who had previously published material on Lindelof's Lost television series — if he was interested in contributing to story elements. Jensen agreed and began to research the history of the Walt Disney Company, particularly Walt Disney's fascination with futurism, scientific innovation and utopia, as well as his involvement with the 1964 New York World's Fair and Disney's unrealized concept for EPCOT. In May 2012, Brad Bird was hired as director. Bird's story ideas and themes were influenced by the fading of cultural optimism that once defined society in the 1950s, '60s, and early '70s, stating that, "When Damon and I were first talking about the project, we were wondering why people's once-bright notions about the future gradually seemed to disappear". When [Damon and I] were little, people had a very positive idea about the future, even though there were bad things going on in the world," Bird said. "Even the 1964 World's Fair happened during the Cold War. But there was a sense we could overcome them. And yet now we act like we're passengers on a bus with no say in where it's going, with no realization that we collectively write the future every day and can make it so much better than it otherwise would be. While keeping information about the plot secret, when asked in November 2012 whether the project would be Star Wars: Episode VII, Bird denied the rumor, but confirmed that Tomorrowland would be a science-fiction film, with Lindelof adding that the film would not center on extraterrestrials. Later that month, George Clooney entered negotiations to star in the film. In February 2013, Hugh Laurie joined the film. In July 2013, Britt Robertson was cast. On January 23, 2013, nearly a week before the title change, Bird tweeted a picture related to the project. The image showed a frayed cardboard box labeled 1952, supposedly uncovered from the Walt Disney Imagineering developmental unit, and containing items like archival photographs of Walt Disney, Technicolor film, envelopes, a vinyl record, space technology literature, a 1928 copy of an Amazing Stories magazine (which introduced Philip Francis Nowlan's Buck Rogers character), and an unidentified metal object. On August 10, 2013, Bird and Lindelof gave a presentation at the D23 Expo in Anaheim, California, where they opened the "1952" box and revealed many of its contents. Later that day a pavilion was unveiled on the D23 Expo show floor which presented the items for close inspection by guests. There was also an accompanying iPhone app which took viewers through the exhibit much like one would experience at a museum. Michael Giacchino was hired to compose the film music. Originally, the film included overt references to Walt Disney's involvement with Plus Ultra, the fictional organization founded by Gustave Eiffel, Jules Verne, Nikola Tesla, and Thomas Edison — including the idea that Disneyland's Tomorrowland was intended to be a cover-up for the real one developed by the group — however, the scenes and dialogue were omitted from the final cut of the film. Pixar Animation Studios created an animated short film, narrated by Maurice LaMarche, that explained the backstory of Plus Ultra, which was planned to be incorporated into an excised scene where a young Frank Walker is transported beneath the "It's a Small World" attraction, and through an informative series of displays, reminiscent of Disney dark rides. Principal photography commenced in Enderby, British Columbia on August 19, 2013, and also filmed in Vancouver (including the H. R. MacMillan Space Centre) and Surrey, ending on January 15, 2014. In October 2013, Kathryn Hahn was cast as a character named Ursula. Also in October, it was announced that part of the filming would take place in the City of Arts and Sciences in Valencia. In November 2013, scenes depicting the Newtons' hometown were shot at New Smyrna Beach, and the Carousel of Progress attraction at Walt Disney World in Florida. On February 5, 2014, additional filming took place at the It's a Small World attraction at Disneyland in California. The film's production designers incorporated the designs of Space Mountain and Spaceship Earth as architectural features of the Tomorrowland cityscape. Per a suggestion by Bird during production, the Walt Disney Pictures opening production logo features the Tomorrowland skyline instead of the studio's conventional fantasy castle. Industrial Light & Magic created the visual effects for Tomorrowland. During post-production, a number of scenes featuring actress Judy Greer as Jenny Newton, Casey's (Robertson) late mother were cut in order to improve the film's runtime. Greer's role was reduced to minor cameo, while actor Lochlyn Munro, who portrayed Casey's live-in uncle Anthony, had his scenes removed completely. 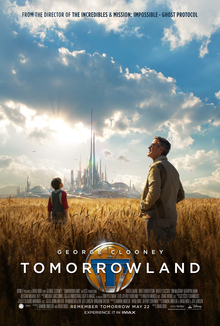 Walt Disney Studios Motion Pictures released a teaser trailer for Tomorrowland on October 9, 2014. Beginning in mid-April, a sneak peek of the film was presented at Disneyland and Epcot in the Tomorrowland and Imagination Pavilion theaters, respectively. Tomorrowland held its world premiere at the Disneyland Resort in Anaheim, California on May 9, 2015. The film was released on May 22, 2015 in theaters and IMAX. Tomorrowland was the first film to be released in Dolby Vision format in Dolby Cinema in North America. Despite owning the trademark to the word "Tomorrowland" in the United States since 1970, Disney released the film in the United Kingdom as Tomorrowland: A World Beyond, and as Project T in several European markets, including the Netherlands, Belgium, and Luxembourg, because ID&T had previously registered the trademark in 2005, for their electronic musical festival of the same name. In compliance to Disney's ownership of the trademark in the United States, ID&T renamed the American version of their music festival as TomorrowWorld. Tomorrowland was released by Walt Disney Studios Home Entertainment on Blu-ray, DVD, and digital download on October 13, 2015. The Blu-ray and digital releases include behind-the-scenes featurettes, the Plus-Ultra animated short film, and deleted scenes. Upon its first week of release on home media in the U.S., the film debuted at number 3 at the Nielsen VideoScan First Alert chart, which tracks overall disc sales, and number 4 at the Blu-ray Disc sales chart with 47% of unit sales coming from Blu-ray. Tomorrowland grossed $93.4 million in North America and $115.7 million in other territories for a worldwide total of $209.2 million, against a budget of $190 million. The Hollywood Reporter estimated that the film cost $330 million to produce and market, and noted that the financial losses by Disney finished anywhere between $120 and $140 million. According to them, Tomorrowland was the third original tent-pole film of 2015 to underperform, following Jupiter Ascending and Seventh Son. Walt Disney Studios Motion Pictures distribution chief, Dave Hollis, commented on the film's debut performance, saying, "Tomorrowland is an original movie and that's more of a challenge in this marketplace. We feel it's incredibly important for us as a company and as an industry to keep telling original stories." Tomorrowland opened in the U.S. and Canada on Friday, May 22, 2015 across 3,970 theaters, earning $9.7 million on its opening day, which was on par with Pitch Perfect 2 (which was in its second week). The film's Friday gross included a $725,000 during its early Thursday night showings from a limited run of 701 theaters. On its first three-day weekend, it earned $33 million, coming in at first place after a close race with Pitch Perfect 2 which grossed $30.8 million. During the four-day Memorial Day weekend, it earned $42.7 million — the lowest opening for a big-budget tentpole since Disney's Prince of Persia: The Sands of Time, which opened to $37.8 million in 2010. Considering the film's $190 million budget ($280–330 million, including marketing costs), many media outlets considered the film's opening in the U.S. and Canada a box office disappointment. Outside North America, it earned $32.1 million in its opening weekend from 65 countries, finishing in first place among newly released film and in third place overall behind Avengers: Age of Ultron and Mad Max: Fury Road. The film's top highest openings occurred in China ($14.1 million), Russia and the CIS ($4.3 million), the UK, Ireland and Malta ($3.2 million) Mexico ($2.8 million), France ($2.5 million) and Japan ($2.1 million). In total earnings, its top three countries are China ($18.8 million), Russia and the UK ($7.6 million respectively). On Rotten Tomatoes, the film has a rating of 50%, based on 264 reviews, with an average rating of 5.9/10. The website's critical consensus reads, "Ambitious and visually stunning, Tomorrowland is unfortunately weighted down by uneven storytelling." On Metacritic, the film has a score of 60 out of 100, based on 47 critics, indicating "mixed or average reviews". In CinemaScore polls conducted during the opening weekend, cinema audiences gave the film an average grade of "B" on an A+ to F scale. Peter Travers of Rolling Stone gave the film two and a half stars out of four, saying "Brad Bird's Tomorrowland, a noble failure about trying to succeed, is written and directed with such open-hearted optimism that you cheer it on even as it stumbles." Stephanie Merry of The Washington Post gave the film two out of four stars, saying "Maybe the ultimate goal of Tomorrowland remains obscure because once you know where the story is headed, you realize it's a familiar tale. The movie can conjure up futuristic images, but the story is nothing we haven't seen before." Moira MacDonald of The Seattle Times gave the film two and a half stars out of four, saying "Though it's made with great energy and inventiveness, there's something ultimately muddy about Tomorrowland; it's as if director Brad Bird got so caught up in the sets and effects and whooshing editing that the story somehow slipped away." Colin Covert of the Star Tribune gave the film two out of four stars, saying "A well-oiled machine of visuals, and yet a wobbling rattletrap of storytelling, the sci-fi fantasy Tomorrowland is an unwieldy clunker driven into the ditch at full speed." James Berardinelli of ReelViews gave the film two and a half stars out of four, saying "For a while, it doesn't matter that the plot meanders. The story seems like a jigsaw puzzle inviting us to solve it. That's the fun part. However, when the resolution is presented, it underwhelms." A. O. Scott of The New York Times gave the film a negative review, saying "It's important to note that Tomorrowland is not disappointing in the usual way. It's not another glib, phoned-in piece of franchise mediocrity, but rather a work of evident passion and conviction. What it isn't is in any way convincing or enchanting." Lou Lumenick of the New York Post gave the film two out of four stars, saying "The film never adds up to the sum of its parts, effectively a two-hour trailer for a movie I'd still be interested in seeing." Steven Rea of The Philadelphia Inquirer gave the film two and a half stars out of four, saying "Unlikely to be remembered in decades to come - or even in months to come, once the next teenage dystopian fantasy inserts itself into movie houses." Ty Burr of The Boston Globe gave the film two and a half stars out of four, saying "Rapturous on a scene-by-scene basis and nearly incoherent when taken as a whole, the movie is idealistic and deranged, inspirational and very, very conflicted." Stephen Whitty of The Star-Ledger (Newark) gave the film one and a half stars out of four, saying "Strip Tomorrowland down to its essentials, and you get an ending out of "I'd like to teach the world to sing" and a moral which boils down to: Just be positive, OK? So OK. I'm positive Tomorrowland was a disappointment." David Edelstein of New York magazine gave the film a positive review, stating that "Tomorrowland is the most enchanting reactionary cultural diatribe ever made. It's so smart, so winsome, so utterly rejuvenating that you'll have to wait until your eyes have dried and your buzz has worn off before you can begin to argue with it." Inkoo Kang of TheWrap also wrote a positive review, saying "Tomorrowland is a globe-trotting, time-traveling caper whose giddy visual whimsies and exuberant cartoon violence are undermined by a coy mystery that stretches as long as the line for "Space Mountain" on a hot summer day." Brian Truitt of USA Today gave the film three out of four stars, saying "A spectacular ride for most of it, and while you're a little let down at the end, you kind of want to jump back on and do it all over again." Linda Barnard of the Toronto Star gave the film three out of four stars, saying "Brad Bird presents a gorgeously wrought, hopeful future vision in Tomorrowland, infusing the family film with enough entertaining action and retro-themed whiz bang to forgive an awkward opening and third-act weakness." Joe Neumaier of the New York Daily News gave the film three out of four stars, saying "Tomorrowland wears its big movie heart on its sleeve, which is to its advantage." A.A. Dowd of The A.V. Club gave the film a B-, saying "Bird stages the PG mayhem with his usual grasp of dimension and space, his gift for action that's timed like physical comedy. He keeps the whole thing moving, even when it begins to feel bogged down by preachiness and sci-fi exposition." Brian Skutle of Sonic Cinema gave the film a B–, saying "What's so surprising about the film isn't how simple the story is, but how lacking of energy the whole thing is. Gone is the excitement and passion that drove The Incredibles and Ratatouille, the high-wire suspense of Ghost Protocol and the nostalgic feeling of The Iron Giant. Bird feels less like the author of this film and more like a hired hand to give Disney a big-budget tentpole based on studio notes." Forrest Wickman, of Slate Magazine, said the film's "politics might be a little incoherent, or naïve. It is a kids' movie, after all." Amy Nicholson of LA Weekly gave the film a B+, saying "Bird has made a film that every child should see. And if his $190 million dream flops, he'll be asking the same question as his movie: When did it become uncool to care?" People will argue about whether we told the proper story or not. People ask, 'Why did you spend so much time in a car when you could have been in Tomorrowland?' But the movie was always intended to be a road movie and its title seemed to suggest, to some people, that the whole movie was going to take place in Tomorrowland. We had a lot of ideas for Tomorrowland but just running around Tomorrowland is not a movie. There has to be a conflict. It has to be somewhat interesting. We set out to make a fable or a fairy tale about what happened to the positive view of the future and how can we get it back and pursue that idea. For better or worse, we did. The musical score for Tomorrowland was composed by Michael Giacchino, a recurrent collaborator of Bird's. A soundtrack album was released digitally on May 19, 2015 followed by a physical release on June 2, 2015. Songs not included on the album, but featured in the film include "There's a Great Big Beautiful Tomorrow" and "It's a Small World (After All)", both written by Richard M. Sherman and Robert B. Sherman, and "I Got Mine" by The Black Keys. ^ "TOMORROWLAND: A WORLD BEYOND (12A)". British Board of Film Classification. May 7, 2015. Retrieved May 7, 2015. ^ "Tomorrowland". AMC Theatres. October 8, 2014. Retrieved May 6, 2015. ^ FilmL.A. (June 15, 2016). "2015 Feature Film Study" (PDF). Retrieved May 8, 2018. ^ a b c "Tomorrowland (2015)". Box Office Mojo. Retrieved March 18, 2016. ^ a b Ito, Robert (May 14, 2015). "Going Back to the Future for 'Tomorrowland,' From Disney". The New York Times. Retrieved March 17, 2015. ^ a b Fleming Jr., Mike (June 9, 2011). "'Lost's Damon Lindelof Makes 7-Figure Disney Deal To Write Secret Sci-Fi Feature". Deadline. Retrieved January 29, 2013. ^ a b Breznican, Anthony (January 28, 2013). "Disney's mysterious '1952' movie has a new name ... 'Tomorrowland' -- EXCLUSIVE". Entertainment Weekly. Retrieved January 29, 2013. ^ a b Flores, Terry (May 10, 2015). "Disney Throws Lavish 'Tomorrowland' Bash at Disneyland — With George Clooney". Variety. Retrieved May 11, 2015. ^ Lang, Brent (April 22, 2015). "'Tomorrowland' Inspired by Walt Disney's Vision of Utopia, Epcot Center". Variety. Retrieved May 11, 2015. ^ a b c "Tomorrowland: Press Kit" (PDF). The Walt Disney Studios. Retrieved May 14, 2015. ^ a b Breznican, Anthony (November 7, 2013). "'Star Wars: Episode VII': Release set for December 18, 2015 -- BREAKING". Entertainment Weekly. Retrieved November 7, 2013. ^ a b c Giardina, Carolyn (April 15, 2015). "'Tomorrowland,' 'Inside Out' Will Help Launch Dolby Cinema". The Hollywood Reporter. Retrieved June 23, 2015. ^ Snieder, Jeff (April 22, 2015). "Disney Debuts Pixar's 'Inside Out,' Action-Packed 'Tomorrowland' Trailer at CinemaCon". The Wrap. Retrieved May 23, 2015. ^ Jayne Isaac, Paulina (May 22, 2015). "'Tomorrowland': What the Critics Are Saying". The Hollywood Reporter. Retrieved May 24, 2015. ^ Labrecque, Jeff (May 22, 2015). "Critical Mass: Is Tomorrowland brilliant, or does it fly too close to the sun?". Entertainment Weekly. Retrieved June 23, 2015. ^ Barnes, Brooks (May 24, 2015). "'Tomorrowland' Is a Box-Office Disappointment". The New York Times. Retrieved May 24, 2015. ^ Verhoeven, Beatrice (October 1, 2015). "Brad Bird Still Bummed About 'Tomorrowland' Flop, Hollywood's Sequel Mania". The Wrap. Retrieved October 14, 2015. ^ a b Pamela McClintock (September 4, 2015). "Summer Box-Office Flops: 'Tomorrowland,' 'Fantastic Four' Top List". The Hollywood Reporter. (Prometheus Global Media). Retrieved September 5, 2015. ^ a b "Tomorrowland Writer Jeff Jensen Reveals the Movie's Secret History". Disney Insider. June 2015. Retrieved October 14, 2015. ^ Fleming Jr., Mike (May 3, 2012). "Brad Bird To Helm Damon Lindelof's Secrecy-Shrouded Script '1952′ For Disney". Deadline. Retrieved January 29, 2013. ^ a b Zeitchik, Steven (May 15, 2015). "'Tomorrowland' director Brad Bird keeps looking for the bright side". Los Angeles Times. Retrieved October 14, 2015. ^ Child, Ben (November 19, 2012). "Star Wars Episode 7: Brad Bird rules himself out". The Guardian. Retrieved January 29, 2013. ^ Fischer, Russ. "Brad Bird and Damon Lindelof's '1952′ Officially Titled 'Tomorrowland'". Slashfilm.com. Retrieved January 29, 2013. ^ Kroll, Justin; Graser, Marc (November 9, 2012). "George Clooney in talks for Disney's alien pic '1952'". Variety. Retrieved January 29, 2013. ^ Bahr, Lindsey (February 14, 2013). "Casting Net: Chris Hemsworth to team up with Michael Mann; Plus Hugh Laurie confirmed for 'Tomorrowland', Marion Cotillard, and more". Entertainment Weekly. Retrieved February 14, 2013. ^ Chitwood, Adam (February 13, 2013). "Hugh Laurie in Talks for Villain Role Opposite George Clooney in Brad Bird's TOMORROWLAND". Collider. Retrieved February 14, 2013. ^ "Britt Robertson Lands Key Role in George Clooney's 'Tomorrowland'". The Hollywood Reporter. ^ Brodesser-Akner, Claude (October 17, 2012). "Details Emerge on Mysterious Damon Lindelof–Brad Bird Project [STORY CORRECTED]". Vulture. Retrieved January 29, 2013. ^ Kevin Day, Patrick; McIntyre, Gina (January 28, 2013). "'Tomorrowland': Brad Bird project gets a title, remains mysterious". The Los Angeles Times. Retrieved January 29, 2013. ^ "D23: Brad Bird, Damon Lindelof explore the secrets of 'Tomorrowland'". Los Angeles Times. August 10, 2013. Retrieved May 12, 2014. ^ D23.com (August 9, 2013). "Walt Disney Studios' Tomorrowland App and Pavilion Revealed! | D23 Expo 2013". D23.com. Retrieved March 31, 2014. ^ O'Connell, Sean (October 3, 2013). "Michael Giacchino Scoring Brad Bird's Tomorrowland". Retrieved October 3, 2013. ^ Sampson, Mike (May 20, 2015). "Damon Lindelof on Why They Cut All the Walt Disney References Out of 'Tomorrowland' Read More: Damon Lindelof on Why There is No Walt Disney in 'Tomorrowland'". Screen Crush. Retrieved June 23, 2015. ^ Guerrasio, Jason (May 23, 2015). "There was an important scene cut out of 'Tomorrowland'". Business Insider. Retrieved June 23, 2015. ^ Breznican, Anthony (August 26, 2013). "'Tomorrowland': Disney teases plot points as George Clooney film gets underway". Entertainment Weekly. Retrieved August 26, 2013. ^ Glassford, Bob (August 2, 2013). "Tomorrowland Prepping at UBC". Retrieved August 4, 2013. ^ yvrshoots. "TOMORROWLAND's 1964 New York World's Fair Set at UBC (University of British Columbia)". Retrieved May 12, 2014. ^ "Kathryn Hahn Joins George Clooney in 'Tomorrowland' (Exclusive)". The Hollywood Reporter. ^ C. Velasco (October 19, 2013). "George Clooney rodará la nueva película de Disney en Valencia en 2014". Las Provincias. Retrieved July 7, 2015. ^ Boedeker, Hal (November 14, 2014). "George Clooney movie hopping Carousel of Progress". Orlando Sentinel. Retrieved February 4, 2014. ^ "Twitter / BradBirdA113: Completed filming TOMORROWLAND". Twitter.com. February 5, 2014. Retrieved March 31, 2014. ^ Leal, Fermin (February 3, 2014). "'Tomorrowland' filming at Disneyland, but Clooney won't be there". Orange County Register. Retrieved February 4, 2014. ^ Bradley, Laura (May 22, 2015). "All the Disney References Hidden Around Tomorrowland". Slate Magazine. Retrieved June 23, 2015. ^ Rose, Steve (May 21, 2015). "Tomorrowland: how Walt Disney's strange utopia shaped the world of tomorrow". The Guardian. Retrieved June 23, 2015. the Space Mountain rollercoaster (look closely and you will spot it on the skyline of the film version of Tomorrowland). ^ Guerrasio, Jason (June 22, 2015). "Why the iconic Walt Disney Pictures logo was changed for 'Tomorrowland'". Businesses Insider. Retrieved June 4, 2015. ^ Guerrasio, Jason (October 14, 2015). "It took a team of 200 people to create the dazzling futuristic world in 'Tomorrowland'". Business Insider. Retrieved October 15, 2015. ^ "Why Judy Greer Was Almost Completely Cut Out Of Tomorrowland - CINEMABLEND". CINEMABLEND. May 19, 2015. Retrieved March 11, 2017. ^ Mauney, Matt (October 10, 2014). "Trailer released for Walt Disney Pictures' 'Tomorrowland'". Orlando Sentinel. Retrieved June 23, 2015. ^ Slater, Shawn (March 28, 2015). "Exclusive Sneak Peek of Disney's 'Tomorrowland' Coming to Disney Parks in April". The Disney Parks Blog. Retrieved March 28, 2015. ^ Carolyn Giardina (May 22, 2015). "'Tomorrowland' Cinematographer Claudio Miranda Talks About Creating First Dolby Vision Theatrical Release". The Hollywood Reporter. (Prometheus Global Media). Retrieved May 29, 2015. ^ Carolyn Giardina (July 22, 2015). "'Hunger Games,' 'Pixels,' 'Everest' Among Upcoming Dolby Cinema Titles". The Hollywood Reporter. (Prometheus Global Media). Retrieved July 22, 2015. ^ Middleton, Ryan (January 8, 2015). "Disney Being Sued by Electronic Music Festival Tomorrowland Over Movie 'Tomorrowland'". Music Times. Retrieved May 14, 2015. ^ Smit, Floortje (May 21, 2015). "Project T: dappere blockbuster met liefdevolle boodschap". de Volkskrant. Retrieved February 20, 2019. ^ "Music festival takes on Disney". The Belfast Telegraph. January 8, 2015. Retrieved May 14, 2015. ^ McMillan, Graeme (October 5, 2015). "Brad Bird Talks 'Tomorrowland' Reception: Can't Tell Every Filmgoer "That's Not What We Meant"". The Hollywood Reporter. Retrieved October 14, 2015. ^ Franich, Darren (October 1, 2015). "Brad Bird shares Tomorrowland deleted scene and talks the 'risk' of original ideas". Entertainment Weekly. Retrieved October 14, 2015. ^ Bishop, Bryan (August 20, 2013). "How Disney Imagineering revealed the secrets of Tomorrowland two years ago". The Verge. Retrieved February 20, 2019. ^ Andersen, Michael (July 23, 2013). ""The Optimist" Draws Fans Into Fictionalized Disney History". Wired.com. Retrieved February 20, 2019. ^ a b Pamela McClintock (June 10, 2015). "Disney Could Lose $140 Million on 'Tomorrowland' Flop". The Hollywood Reporter. (Prometheus Global Media). Retrieved June 10, 2015. ^ Lang, Brent (May 25, 2015). "'Tomorrowland' Exposes Hollywood's Originality Problem". Variety. Retrieved May 25, 2015. ^ Rebecca Ford (May 22, 2015). "Box Office: 'Tomorrowland' Earns $725,000 in Limited Thursday Night Run". The Hollywood Reporter. (Prometheus Global Media). Retrieved May 22, 2015. ^ Anita Busch (May 24, 2015). "Memorial Day B.O. Runs Cold: 'Tomorrowland' Is No Flying Car With $40.7M Bow — Second Sunday Update". Deadline Hollywood. (Penske Media Corporation). Retrieved May 25, 2015. ^ "May 22-24, 2015 Weekend". Box Office Mojo. IMDb.com. Retrieved May 29, 2015. ^ Anita Busch and Anthony D'Alessandro (May 26, 2015). "'Tomorrowland' Slightly Better In Actuals, But Memorial Day Frame Was Still A Downer — Tuesday B.O. Update". Deadline Hollywood. (Penske Media Corporation). Retrieved May 27, 2015. ^ Pamela McClintock (May 25, 2015). "Box Office: 'Tomorrowland' Faces Bleak Future After Soft $41.7M Debut". The Hollywood Reporter. (Prometheus Global Media). Retrieved May 25, 2015. ^ a b Brook Barnes (May 24, 2015). "'Tomorrowland' Is a Box-Office Disappointment". The New York Times. (The New York Times Company). Retrieved May 25, 2015. ^ Scott Mendelson (May 24, 2015). "Box Office: Disney's 'Tomorrowland' Disappoints With 'John Carter'-Like $32M Weekend". Forbes. Forbes, Inc. Retrieved May 25, 2015. ^ "No Holiday as Clooney's 'Tomorrowland' Opens to Weak Weekend Box Office". NBC News. Retrieved May 25, 2015. ^ a b Tartaglione, Nancy (May 26, 2015). "'Tomorrowland's $74.7M Global Bow; 'Pitch Perfect 2′ Singing $190.4M Cume; 'Mad Max' Smokin' $227.7M — Wwide B.O. Update". Deadline Hollywood. (Penske Media Corporation). Retrieved May 27, 2015. ^ Nancy Tartaglione and Anita Busch (May 31, 2015). "'San Andreas' Rocks With $63.9M In Overseas Bow; 'Tomorrowland' Up $31M+ — Intl B.O. Final". Deadline Hollywood. (Penske Media Corporation). Retrieved June 1, 2015. ^ Nancy Tartaglione (June 7, 2015). "'San Andreas' Has Seismic $98M Frame; 'Insidious 3' Scares Up $14M+; 'Spy' Crosses $50M — Intl B.O. Update". Deadline Hollywood. (Penske Media Corporation). Retrieved June 8, 2015. ^ Gavin J. Blair (June 8, 2015). "Japan Box Office: 'Tomorrowland' Opens on Top, 'Mockingjay' Struggles". The Hollywood Reporter. (Prometheus Global Media). Retrieved June 8, 2015. ^ Nancy Tartaglione and Anita Busch (June 15, 2015). "'Jurassic World' Crushes All-Time Offshore Opening Record; 'San Andreas' Rocks On; Eyes On 'Spy' — Intl BO". Deadline Hollywood. (Penske Media Corporation). Retrieved June 16, 2015. ^ "Tomorrowland (2015)". Rotten Tomatoes. Fandango Media. Retrieved April 23, 2018. ^ "Tomorrowland Reviews". Metacritic. CBS Interactive. Retrieved May 28, 2015. ^ Travers, Peter. "'Tomorrowland' Movie Review". Rolling Stone. Retrieved May 23, 2015. ^ Merry, Stephanie (July 16, 2013). "Always-cool George Clooney can't lift meandering 'Tomorrowland'". The Washington Post. Retrieved May 23, 2015. ^ Macdonald, Moira (May 23, 2015). "'Tomorrowland': Exhilarating for kids, exhausting for adults". The Seattle Times. Retrieved May 23, 2015. ^ "'Tomorrowland' goes back to the future badly". Star Tribune. Retrieved May 23, 2015. ^ James Berardinelli. "Tomorrowland | Reelviews Movie Reviews". Reelviews.net. Retrieved May 23, 2015. ^ A.O. Scott (May 19, 2015). "Review: 'Tomorrowland,' Brad Bird's Lesson in Optimism". The New York Times. Retrieved May 23, 2015. ^ Lumenick, Lou (May 19, 2015). "Clooney's disappointing 'Tomorrowland' goes off the monorails". New York Post. Retrieved May 23, 2015. ^ Steven Rea, Inquirer Movie Columnist and Critic (October 22, 2012). "'Tomorrowland': In the future, past is prologue, maybe". Philly.com. Retrieved May 23, 2015. ^ "It's past, present, and future in 'Tomorrowland'". The Boston Globe. May 19, 2015. Retrieved May 23, 2015. ^ Stephen Whitty (May 19, 2015). "'Tomorrowland' review: George Clooney's sci-fi folly". Newark Star-Ledger. Retrieved May 23, 2015. ^ David Edelstein. "Movie Review: Tomorrowland". Vulture. Retrieved May 23, 2015. ^ Inkoo Kang (May 17, 2015). "'Tomorrowland' Review: George Clooney's Dystopian Drama, Like Disneyland, Is Exhausting Fun". Thewrap.com. Retrieved May 23, 2015. ^ "'Tomorrowland' isn't short on wonders". Usatoday.com. May 19, 2015. Retrieved May 23, 2015. ^ "Tomorrowland's bright future includes George Clooney: review". Toronto Star. March 16, 2015. Retrieved May 23, 2015. ^ "'Tomorrowland' Review: The future can wait". New York Daily News. May 19, 2015. Retrieved May 23, 2015. ^ A.A. Dowd (May 19, 2015). "Review: Disney's Tomorrowland realizes a bright future dreamt up in the past". The A.V. Club. Retrieved May 23, 2015. ^ Skutle, Brian (2015). "Tomorrowland". Sonic Cinema. ^ Wickman, Forrest (May 28, 2015). "No, Brad Bird Isn't a Disciple of Ayn Rand - The key philosophical influence on the director of Tomorrowland and The Incredibles isn't the Atlas Shrugged author. It's Walt Disney". Slate Magazine. Retrieved October 10, 2015. ^ Nicholson, Amy. "Don't Hate Tomorrowland for Asking Us All to Be Better". L.A. Weekly. Retrieved May 23, 2015. ^ "Back to the Future: Brad Bird on Tomorrowland's Deleted Scenes, Incredibles 2's Progress and Animated Prologues". Disney Insider. October 13, 2015. Retrieved October 13, 2015. ^ Lenker, Margaret; Lenker, Margaret (January 12, 2016). "'Star Wars,' 'Game of Thrones,' 'The Peanuts Movie' Lead Visual Effects Society Nominations". Variety.com. Retrieved February 20, 2019.